UPDATE: Thanks for entering this contest! The winner, Brandon Vickers, is announced below. More contests are on the way, so watch the feeds for more, coming very soon. Special thanks to B&H Photo and Video for sponsoring the prize giveaway. To start, let’s (belatedly) congratulate Christina C. for winning Senal headphones during that contest we wrapped up recently. Lots of you participated, and it was a great way to make more connections. Big thanks to B&H Photo and Video for sponsoring the contest. You might even like this next one better, thanks again to B&H. 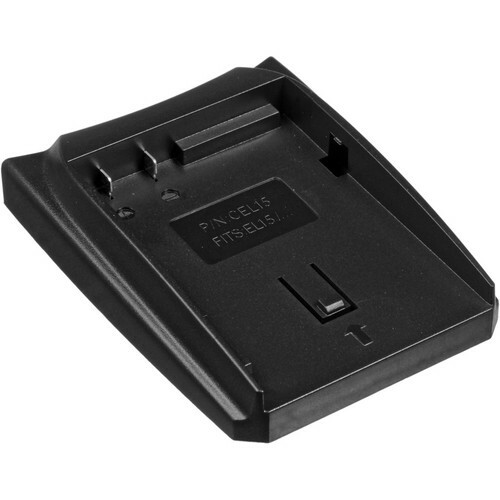 In a world of radically different standards, from lens mounts to flash memory cards, sometimes there’s a special kind of product to unify things we all have in common: like, the need for freshly charged batteries. And another thing: besides the travel-minded chargers we always get for free with each camera we buy, eventually we always return to home base (or studio space if you’ve got the room). 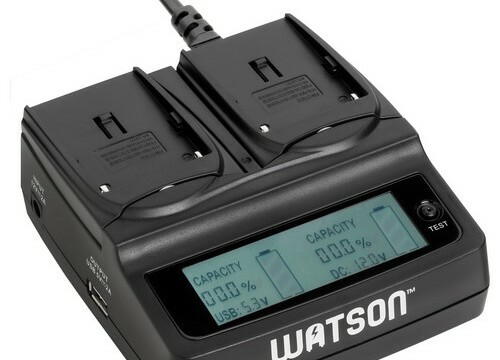 Rather than setting out an octopus of cords and wall warts fighting for room on a surge protector, check out this Watson Duo Charger with interchangeable plates. I’ve been using mine for a few years now, and I can’t imagine working without it. 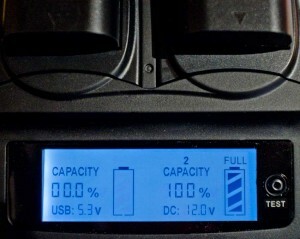 You start by matching the base charger with a pair of plates that you choose, based on the battery type you want to start with, but the thing that’s so friendly and easy about this system is that the plates are under two bucks, available for every camera battery type you’ve ever seen (or heard of). 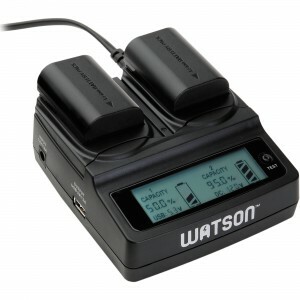 Another feature that very few camera battery chargers have is a percent-full readout, and the Watson Duo Charger has a backlit LED display showing the percentage full, with bar graphs, for each of the two sides. 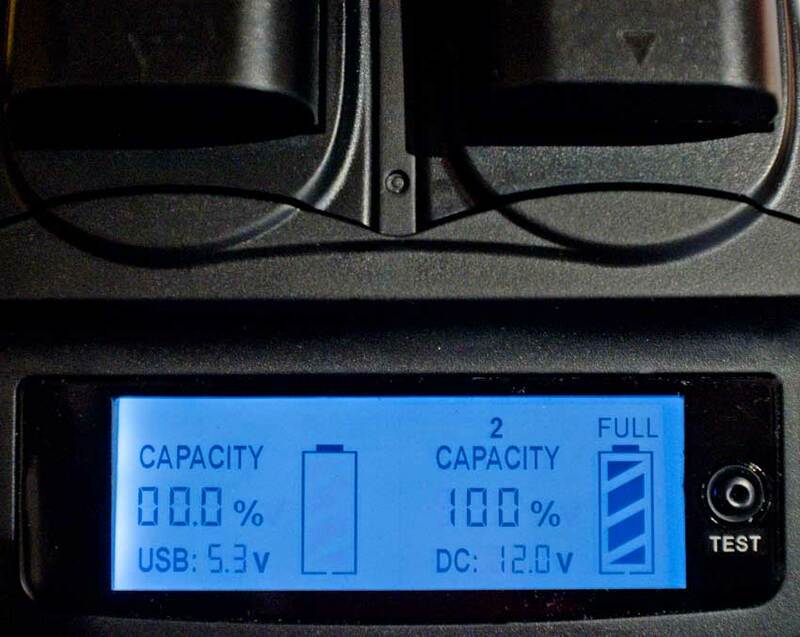 I found myself using it most often to see whether I even needed to bother charging a battery, because normally a charger just tells you if it’s charging, or if it’s done – that doesn’t help at first, because all batteries take a little charging at first, even when they’re mostly full. Seeing how full is a big time-saver. And then, what if you need to charge away from your base? Still worth investing in this system? Well, you could always bring the Duo Charger with all the different plates you need, as it’s not too big (and I like the way its power cord terminates in a standard AC plug, rather than a wall wart). But for even more portability, there’s also a wall charger you can buy, to slide any one of those plates into. It has retractable prongs as well, with a single LED to tell you when it’s finished charging. The plates snap into place firmly, whether into the duo charger or travel charger. You may find that removing a battery from a plate actually causes the plate itself to slide out from the charger, though; it’s a compromise between making the tension too strong for the batteries, and too weak for the plates, but I found that getting into a habit of holding down the plate whenever removing a battery is the solution. Another feature I like is the 5 volts DC USB power port on the side, once again sparing us from yet another adapter in the mix. You can get it for free (an $80 value), courtesy of B&H Photo and Video, by racking up points below to increase your chances before this contest is over on May 15 at 3:00 p.m. EST. Good luck, and thanks for checking in! If you have any questions or concerns about how this cool new web app works, please leave them in the comments below.